Whether it was good timing or luck, for the second time this year I was able to see a top prospect prior to promotion. 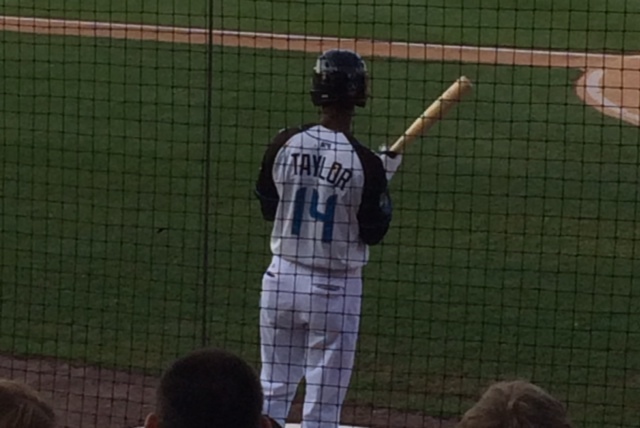 Due to the injuries to recently recalled Steven Souza and Jayson Werth, it has surfaced on twitter that Michael A. Taylor (with the A. to discern him from former prospect Michael Taylor from Oakland) will be called up to join the Nationals tomorrow in Atlanta. It was a family night promotion so it was pretty busy at the park but I did my best to get video from my seat. Before I roll to the videos, I have to say that describing Taylor as lanky is an understatement. When I watched Gregory Polanco, he had more muscle tone on him but Michael is much thinner. However, one thing that he does possess is a very strong arm from center field. He threw out a runner attempting to score from second on a single with a simple release but it was a frozen rope. I was distracted by being Dad at that so no video of the throw but it was fantastic. When I was fortunate enough to watch Gregory Polanco, there was a presence to him that made you feel like he did not belong in the minors. While I liked some of Michael A. Taylor’s game Friday night, I think he needs more seasoning at this level. Even though he is in the midst of a career year in the minors, staying at AAA and working through his approach would benefit him. His defense is big league ready but he may struggle to make contact in his first go around in the majors. Deeper mixed leaguers can possibly benefit by adding him and NL only owners will bid. I think we will see more speed initially than power but his tools are intriguing. It will be interesting to track. Whereas I saw Polanco as an immediate add, I would take a wait and see approach to Taylor for 2014.